This is an awsome lesson! Big THUMBS UP! The band called out Rebel Yell last week...thought to myself Steve Stevens is not going to be easy. Saw a short video on youtube for the intro..."looks like a jamplay lesson"...sure enough, found it. The breakdown has helped me a lot. The guys are going to be surprised for sure...Thanks Steve! The sounds cuts out of the section 6 video ("The Solo") after 01.07. What's up with that? 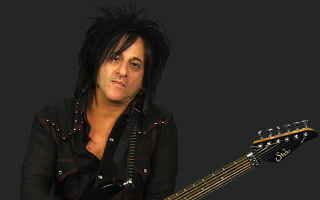 Otherwise, great lesson and it's really awesome to learn the song from Steve Stevens himself. Hi, I checked the videos at the spot you mentioned and I didn't notice an audio drop out. Is anyone else having an issue? Hi, you'll need to submit a support ticket. There's simply no way for us to check the comments of 5000 lessons everyday. Our support team is standing by to help but they only become aware of an issue when you submit a support ticket. Thanks for your patience. In scene three beginning, he plays a much longer riff than the one he teaches. What do I do after the 5th string E5 chord? Steve is an excellent instructor. His explanation and break down on this song is stellar. He makes it so clear and understandable. Thanks Steve. Wow! what a fantastic lesson by Steve Steven's. I was a great fan of Billy Idol and didn't know who Steve was at the time when this song was a huge hit. But what a great Rock song this is, and full credits go out to Steve on an awesome lesson and insight to this great rock song. Great job Jam Play for organising this lesson pack by Steve. From Spain my admiration for Steve Stevens. Just revisiting. Never enough. Thanks!! one of my favorite players and a reason I play today!! I heard TopGun as a kid and loved it! But I did not understand the true brilliance of it!! Same with the IDOL stuff that my uncles force fed me... I just knew i had to play guitar :-D Thanks Steve, you rock!! I often wonder what made the 80's have so many great hits. I want to thank Jam Play for bringing such a great artist to teach us this awsome song. This is great. Thanks Steve for sharing this. Really enjoyed this and your previous lessons. wow what a treat having you show us the ins and outs of this song-and love hearing the insights you give as to how these songs came about.more please. Yeaaah, Thanks Steve! Time to refresh that stuff. Pure Awesome! Thanks Jam Play & Steve - Steve, you are one the most awesome, sometimes under appreciated, guitar greats! Your playing approach is genius and inspiring! Thanks a Ton for Sharing.